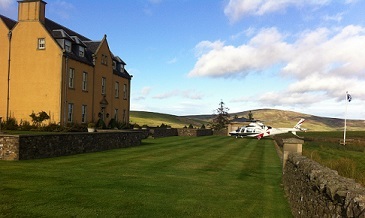 Flying parties to Dartmoor, the North Yorkshire Moors, Wales and the Scottish Borders. The first flight of this year’s Game Shooting season was for a party of three who booked into the stunning Mayshiel Shooting Lodge in the Scottish Borders (left). The 315 mile trip from Kings Lynn in Norfolk to the estate in East Lothian took an hour and a half. If you already have a destination in mind, please give our Operations Team a call on 01256 635000 and they can arrange the flight and most convenient departure point. Atlas Helicopters can fly both small and large game shooting parties to all parts of the UK. Each helicopter in our fleet provides room for at least five passengers up to a maximum of thirteen in our Sikorsky S-76. There is space for shooting equipment (including guns and ammunition) and fieldsport dogs can be transported safely on board. Not only does helicopter travel reduce the journey time but makes it much easier to reach these difficult country sites. You avoid long and protracted journeys by road, which often include narrow, unlit roads and country lanes, places that are hard to find using Sat Navs. Game shooting venues around the UK have seen a rise in popularity in recent years with more “guns” opting to use a helicopter to access their country outdoor pursuits rather than wasting their time travelling to venues. Atlas Helicopters’ Operations Team are experienced at arranging flights into most of the popular game shooting grounds, as well as many lesser known venues. You will be taken effortlessly to your chosen venue, whether you are flying as a syndicate, or a lone gun meeting fellow shooters on arrival. Having just added an Augusta A109E (left) to our extensive fleet we now have faster flight times into the countryside (see below). Flexibility is important to busy clients so with a helicopter fleet capable of flying at night, we regularly provide an aid to night landing tasks so you will not be limited to travelling for game shooting events in the daylight only. 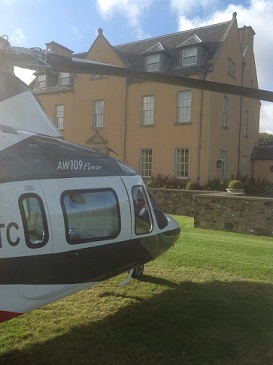 You can choose for the helicopter to bring you home at the end of a successful day’s shoot, or later if you wish to enjoy a weekend or even longer. Game shooting has never been so easy to enjoy. 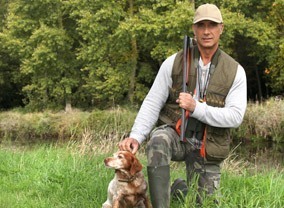 Such flexible travel is so easy to arrange – all you have to do is concentrate on filling your shooting bag! 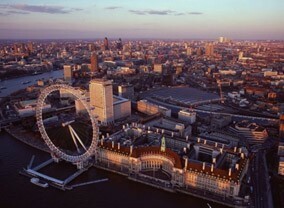 The flying times below are from London Heliport to some of the most requested game shooting areas. We are also able to depart from many other locations around the UK and if your garden is big enough, we can pick you up from there.